It has a clickable index and clickable highlight links. Give it at try! More Important - tell us what you think! Over the years we have collected a bunch of neat stuff. PDFs: click to display. Will display on separate tab & can be downloaded. In some cases we can provide the original MS Office file if requested by email. A linked Website's content will display on a separate tab (we don't control that content). The Problem: Our group has steadily expanded. We have focused on improving the relevance of our meetings while trying to help all those who contact us via phone or email. We've had more speakers and better information. We would like to be better at what we do, but it's been hard to know where we should focus our efforts. The Treatment: Our support group was examined by some project management specialists. Member David Bush, an experienced Project Manager and really-focused-guy, got us an invitation to the Project Management Day of Service (PMDoS). This service project by professional project managers is designed to examine local non-profit organizations and help them improve their results. Develop a plan to become better at what we do. Recruit more volunteers. This is a big project. Our current team is too small. Create a core management team and organize volunteers with assigned jobs. Improve Marketing via free newspapers and (most frightening) "Social Media"
Improve our Web site to work better on smartphones & tablets (60% rely on them). Core Team: We have a tentative list. Some are busy, some not given a task yet. Trying to improve our approach to speakers and in-meeting admin support. Contact Data: Much raw data gathered, more coming. Plan to start a verifying campaign in April or May. Have several ideas about technology, but no decisions yet. Marketing: Need a Logo - critical for Web use, especially with smartphones. Marketing: Maybe a new group name and acronym? Web site: Lots of ideas, little time available yet. 2019-Mar-2 We had a regular go-around meeting. At the beginning, Mike made a presentation on the opportunity our group can offer to be part of a TEAM. As we improve our operations, those opportunities will steadily expand. We passed around a sign-up form, followed by a lively discussion of what kinds of things needed to be done. Over the next few days, Steve followed up with everyone and was able to get many commitments and quite a few "maybe"s.
For the moment, the ball's in our court - get ready for the volley back! Everyone who comes to a support group meeting is a member of a TEAM. Perhaps not for long. Perhaps not consciously. But when you are there, whether only once or many times over a period of years, you are helping others. At that moment you are delivering help. Give yourself a chance and you can feel the "spirit" part of Team Spirit. PN is tough. PN may boot you off some teams, but we have one waiting for you. No job is too small. We are not very well organized yet, but we are trying hard. Please be a member of our team, even if you can't come to our meetings. 2019-Feb-2. Life intervened for Steve and I. Fortunately, new member Susan Tipton, an experienced discussion leader from her professional life, agreed to lead the meeting. It was a smashing success. Even more eye-opening, Susan made extensive notes about the discussion highlights and generated a report for us. While Steve and I try to do this, we fail to follow up as much as we would like. There are relevant time constraints, not to mention our active involvement (i.e., we both sometimes talk too much to take good notes). We should have a meeting about hearing loss and aids. Lots of dissatisfaction expressed. People much prefer canes and walking sticks that FOLD! A smaller group (12 with 3 new) was just right to allow everyone to talk. Robert was very helpful soliciting comments from the new people. A new job for him? Max returned. We are so glad for his return after the death of his wonderful wife. At every meeting we should try to recruit a "recording secretary" to take notes and write them up. We need a way to incorporate such notes into our contact data. We need a "tickler file" and a volunteer to check that it's followed up. Currently Steve & I email each other for that. Not always reliable. A treatment to stop PN’s neuron death could come soon or not for a long time. There seems to be nothing on the immediate horizon. Even if a treatment stopped all further cell death, there are millions of Americans already severely disabled. SO, is there nothing that can be done for the severely disabled or those about to be? The video shows how external sensors can be relatively inexpensively added and used by our brain to replace senses (like sight and hearing) that have been lost or absent. The external sensors demonstrated (in this case, for hearing loss, via a phone app and vibrators in the vest worn in the photo above) do not require expensive surgery or complicated computer systems. Sound ridiculous? Watch the video! All of Eagleman’s examples required a “feedback” source to show the brain what a “correct” response is so the brain can learn how to use the new artificial sensor. What would “feedback” be for an artificial balance sensor? If other sensations (touch, heat/cold, damage) could be added artificially, what feedbacks would they use? European insurance and government health plans are already considering or approving the use of some exoskeletons (in special cases). What could be done for that to happen in the US? If science could design either new sensors or new “muscles” what can we (members of a support group) do to make that happen sooner? A practical example of the Eagleman concept? In the meeting, one member showed us her new strap-on flexible brace. She said it helped her balance a lot. I have advocated use of inexpensive devices like the Ossur "Foot-Up," in lieu of braces, to lessen the risk of tripping because of foot-drop. But the "Foot-Up" (discussed elsewhere on this page) only addresses foot-drop, not balance. Can a flexible brace serve to transfer sensory information that we have lost from our feet to sensors we still have higher in the calf? My head is working hard. I think I need to check this out! 2018-Dec-1 Our Go-To Yoga/Tai-Chi angel, Cynthia Maltenfort, came to give us an inspiring lesson and introduction to Chair Yoga. Folks in the above picture have a variety of physical problems and it really helps to have a teacher who has used her knowledge and craft to deal with her own physical challenges. Maybe it should be enough to be TOLD to do something. For most of us, it usually isn't. We could all feel Cynthia's "I've been there" conviction that this stuff really works. We're a support group - empathy is an essential element. It doesn't hurt to have a friendly and technically proficient teacher in the bargain. And the mesmerizing sounds and incense at the end left us all in a relaxed and joyful mood. People with PN (as patient or caregiver) have had to adapt. Use of the word "chair" in "chair yoga" signals that there remain viable paths to wellness even in the storm called Peripheral Neuropathy. This afternoon I will be attending my first chair yoga class at our local studio. Cynthia took us through a famous sequence called "The 8 Brocades." You can access videos of standing versions on her website <https://www.theartofqi.com/8-brocades/>. Her website also has an "about" page, where you can read about the extensive educational process she has used to become the astounding person we saw. Cynthia usually works out of the Sun & Moon studio in Fairfax City; their <website> has schedule information. As a warm-up, Mike made a 5-minute pitch on the importance of choosing an exercise mode YOU ENJOY in order to ACTUALLY DO the exercise. See his <blog post> on the subject. Opinion: Therapies are a frequent topic at our meetings. Unlike most "new" therapeutic offerings with evaluation periods measured in months or years, Far Eastern practices such as Yoga, Tai Chi and acupuncture rest on testing periods measured in millennia. Western medical & research approaches, developed over the last 600 years, have struggled to separate wheat from chaff in collections of medical wisdom. Many therapies are difficult to tackle with double-blind randomized controlled trials. Astrology, Voo-Doo and blood-letting have been rejected. Others, such as heart stents and arthritis scraping are teetering. Our ability to understand Eastern techniques like Yoga rests on our ability to understand the peripheral nervous system (PNS) and its interaction with brain and the rest of the body. That is the heart of the problem: Our knowledge of the diffuse PNS is relatively primitive compared to our knowledge of any other bodily system (including the brain). Our relative ignorance makes it hard to see HOW these Eastern techniques work. Millennia of experience suggests we should keep looking and testing. With slim options, PN patients might want to volunteer first. 2018-Nov-3 We had a normal support group meeting in Annandale. 20 in attendance with three new patients and their caregivers. Highlight: a harrowing tale of poor medical care using narrowly focused,specialists. Our member was in great pain, with a variety of problems. Being loaded, over time, by her neurologists with increasingly hard-to-handle pain meds. Faced with a recommendation to start an opioid, she decided, on her own, to instead go gluten-free for two weeks. All symptoms dramatically improved (except, of course, her PN damaged balance). Doctor's response to this good news? "You should probably resume taking the meds we recommended." What??? Broader Take-Away: We greatly benefit when you bring your stories. LowLIght: Steve got mad at me when I dropped too deeply into my Debbie-Downer "The sky is falling" language. My wife wasn't there to punch me in the shoulder. We met at Floris Methodist Church in Herndon, VA. We met there last October also, but had a larger room. 20 people crowded into the room (We did not expect so many). It was a VERY lively discussion, with several new attendees. Steve had an extensive Exercise for PN handout <PDF>. He also distributed a fill-in form <PDF> from GeoFit that you can print to track your planned goals and activity. Most of the exercise names are recognizable. What can a web site like this one or any web site or YouTube do for you, the reader, the patient and the caregiver to set up a reasonable exercise program? The internet info on exercise is an incomprehensible fire hose. I think home PT visits to setup an exercise program should be part of normal treatment. Can it be? Read and comment on my Oct 2018 Blog Post on Home PT visits. What can a Support Group do? What should it do? Our September 8th meeting raised those questions. 34 people came. It allows people with something in common (often of great concern or hard to deal with) to get to know one another and safely share. That's hard to do with 34 people; a smaller group can work better for that. It has a role in educating people about their shared issue. A big group has an advantage in that there may be people who can share a wide variety of experiences and levels of progress. That's especially true of Peripheral Neuropathy (or any brain or nervous system disorder) where the "Settled Science" is so unsettled. But some who come may not need to come often or long once they clearly grasp what is happening. For that, a group needs to be just large enough so people have a chance to ask questions and be heard. It can serve as an organizational framework to attract speakers or other experiences that a small group might not be able to get. For that, a large audience is better. It can encourage spread of the techniques. For that, attracting and supporting leaders is critical. For that, we need to a wide variety of group sizes and makeups. 2018-Aug-4 We had a semi-normal meeting. With publication of the Post Article we had many inquiries. We expected and got new people: 11 including 2 caregivers! We splurged on a projector rental and made a brief <Introductory presentation on living with PN> before getting down to the serious business of sharing, listening and being understood. Passed around a form (based on a widely cited 2013 article) to fill out that shows how basic symptom patterns can be used to classify types of neuropathy (most rare; the one labeled "Pattern 2" is the one most of us have). With one exception, everyone seemed to have garden variety PN. Pete brought goodies! Then we had a discussion with Carol Brooks, a genetics specialist coordinating patient education for a company testing a treatment for a rare genetic version of amyloidosis. Update: 8/24/18 - FDA has approved use of the treatment. There are many types of amyloidosis. Each one causes the byproducts of the immune system (amyloid) to be incompletely broken down so they accumulate in bad places. In the brain it is implicated in Alzheimer's. But they also accumulate in and around peripheral nerves - in other words it can cause PN. The rare kind Carol's company is fighting almost always causes neuropathy, frequently PN. Carol works with support groups as part of her job, was in town for a conference and offered to come by and talk about genetic diseases, the diagnosis challenges of amyloidosis (especially rare ones) and about working with support groups and caregivers when dealing with participation in clinical trials. - 41% report fair or poor emotional state. 2018-May-5 Members and caregivers (26 in all) got rocking and moving and talking when Terry Drew and Angela Lilley (home visit specialists in Physical Therapy and Occupational therapy, respectively, from Capital Home Health in Leesburg) came to get us up and going. They showed a number of techniques and equipment aids. Some members really liked the Shiatsu foot massage machine. What great fun! They emphasized that physical activity was essential but needed to be customized for each patient and their home situation. They pointed out how unusual it was for PN patients to get a prescription for home visits. Our suggestion to the gathered members: Be different and simply insist! If you don't ask, you won't get. Doctors and insurance companies don't have PN on the front burner. Yet. 2018-Apr-7 We had a Tai Chi workshop with Cynthia Maltenfort, an excellent teacher with Sun & Moon Studio in Fairfax City (Their Web Site) who focused on how Tai Chi can help us prevent falls and new exercises, all customized for PN. This was a PAID appearance: your Pass-the-Hat taxes at work! My Bias: in addition to being a gentle and clear teacher, Cynthia has the rare ability to face the class and SAY "left" while SHOWING "right" - the effect is magical. 2018-Mar-10 FPN sponsored a Patient Conference at DC's Sibley Hospital. Reservations for attendance were open to the public and people came from all over he East Coast. There were a number of presentations about PN by researchers from Johns Hopkins. One result: offers from volunteers to participate in the PN Research Registry have increased dramatically. Including several of our members, Mike is being evaluated (which means, I guess, there is no insanity exclusion). 2018-Feb-3 We got a BUNCH of new folks, most of whom had read about the group in The Golden Gazette. We focused the meeting on mutual support. We got more Gazette-referred people in May, so Steve is thinking about trying to contact some other local papers. 2017-Dec-2 Let's learn to talk about this! Dr. Sarah McQuide, a health psychologist from Baltimore guided us through practical aspects of living, thinking and talking about our experience with PN. Dr. McQuide wants us to grab onto good thinking and good talking and fend off the approaches that make bad things worse. Using these simple, clear handouts, she discussed the psychological aspects of having a chronic condition like peripheral neuropathy, coping mechanisms, when & how to talk to others about our conditions, how caregivers can help, and the importance of caregivers' psychological health maintenance. I hope to add a blog post discussing her recommendations. 2017-Nov-4 Chronic Pain: A Mind on Fire. Dr. Gary Kaplan of the Kaplan Clinic in McLean VA, gave a powerful appeal for a wider approach to care, especially for patients for whom pain is a significant issue. The following slideshow tries to make a main point: Body and Brain problems appear in tandem and both must be addressed to cure either. For more details, read and comment on my Blog Post. 1. Her background equipped her with a rare ability to address our questions. Before joining Hopkins as coordinator of the PN Research Registry, Simone spent more than 20 years helping US astronauts (super-healthy and smart but not necessarily introspective about their health) understand complex aspects of human biology. Their "understanding" was vital for NASA's scientific research goals. During her <Presentation PDF>, Simone patiently accepted and answered a wide variety of questions, honoring both question and questioner, threading together accurate responses using simple language. A rare gift honed on astronauts' hard heads. We hope to have her back. 2. She works in the middle of the research world. Her answers reflected that position. Cure's elusive, puzzles rampant, research underfunded (But happening!). Big take-away: while we all wander in the fog, place a lot of your bets on exercise. Simone runs the Hopkins portion of the PN Research Registry (PNRR). It's hard to believe, but there has been no national set of "longitudinal data" (data that follows a set of people over a long period of time) on patients that have ALL types of Peripheral Neuropathy. Such data sets do exist for certain sub-types of neuropathy, but not for the broader PN population. The Foundation for Peripheral Neuropathy is the chief funding source for this one, which does have that broad focus. Hopkins is the leader of a group of research institutions that are participating..
Increase my vigorous exercise schedule from 4 days to 6 days per week. Vigorous exercise improves blood flow and there is evidence that poor blood flow to legs may be a factor in nerve death. Vigorous, but not extreme. Cruising @ heart rate=120 for 20 minutes is better than peaking at 145 and pooping out at 10 minutes. Daily balance and strength exercise is vital to train the connections between the brain and our deteriorating nerves. This is the appeal of Tai Chi. So we need both vigorous and balance/strengh exercise. Almost every day. One is not a substitute for the other. Every disease is different and many (but not all) are powerfully supported by their own patient communities, charities, support groups and research projects . The "Every Disease for Itself" approach allows extraordinary inefficiencies when the fundamentals of neuropathy are common to all. A single foundation (like the Diabetes Association or the American Cancer Society) to incorporate all these neuropathy-related diseases may be impractical and unneeded. The proposed solution is a "Coordination Center" with rules that encourage direction and order in what is now a rather chaotic environment. Or look at our (totally unauthorized) multi-date version, suitable for refrigerator posting to track your changes. We are trying to induce some High School students to write a Smartphone app to keep track (for "free"). Overall, balance training appears to be the most effective exercise intervention. Focusing exclusively on strength (or endurance and strength combined) has lower impact. For metabolically induced [i.e. diabetic] neuropathy (by far the most common type), endurance training plays an important role. NOTE: context support: Mike's presentation on muscles & PN (see notes on 2018-Mar-3 meeting) makes the point that the fastest muscles (needed for peak strength) must be exercised to some degree to slow progression of PN weakness. A balanced program will have some of this. Simone Thomas emphasized (see notes on 2017-Oct-7 meeting) that high tempo exercise is needed to encourage blood flow. Again, a balanced approach is needed. 2017-Mar-4 - Preliminary results of study on effects of diet & exercise on PN symptoms. Two U. MD coordinators of patient participation in the study also shared insights on how patient attitudes affected study participation and (hence) results. Will post report when released. 2016-Dec-3 Lee Perry of Driving Aids Development Corp (DADC) on adding hand controls to autos. We drove one around the lot. <Their Website>. Most ordinary cars can have hand controls added. The cost, which can be modest, depends on the car and the choice of functions to be added. In most cases, a modified car can be driven in both the normal manner (such as by a caregiver or by a patient wanting to proactively obtain experience) or by using its hand controls. Mr. Perry holds many patents and is one of the country's leaders in this technology. One of our members has DADC controls and is quite pleased. Two others are planning to get controls installed. There are other hand-control vendors. We've not had an opportunity to meet with them. Hand controls have a "cottage industry" feel to them. As far as I know, there are no national or world standards for them, such as safety or performance specifications (like minimum braking distances or reaction times using a hand brake). In fact, DADC is a small business operated out of Mr. Perry's home in Vienna, VA. Departments of Transportation (such as Virginia's) do have regulations that specify things like restrictions on driver's licenses that specify that the operator must have certain hand controls to be allowed to drive. Potential adopters must work with their auto insurer to see what coverage is available. Lee Perry went over some of this at our support group meeting, but anyone considering use of this technology should contact their vendor and begin a serious conversation. I suspect the final call in many cases will be made by a DOT driving inspector who watches how well the disabled person drives when using one of these modified cars. While the devices are easy to use, there are special training classes to become evaluated and certified. "Driving a car or van with push pull hand controls should only be done by those who have had sufficient training by a Certified Driver Rehabilitation Specialist (CDRS). " 2016-11-5 VCU research neurologist Dr Jason Wong answered a LOT of questions <Notes PDF>. We hope to have him back some day. Personal Note: I've always found it puzzling that PN seems to continue even though its "cause" is no longer present. I used to be pre-diabetic but now am not - PN started back then and continues now. It seems mysterious. Is PN like going over a cliff - one step more and all is lost? According to Dr. Wong, this is a familiar story and a familiar belief. He thinks this belief is wrong. To paraphrase: "If nerves are dying, something is killing them. Remove the something (the cause) and the nerves will stop dying. They may never regenerate, but they will stop getting worse." In his view, we often don't REALLY know what the continuing cause is. Or, rather, we see an association but we don't know what is going on under the covers. Not a global mystery. Mostly just ignorance about the grubby case-by-case details. According to this logic, since there are effective treatments for some cases that stop PN progression, there should be treatments for all the other cases, too. If we could find them. Even if the tests (there are LOTS of tests) do not show it, maybe my pre-diabetes or something is still there, thrumming in the background, continuing to kill my nerves. Maybe there is something going on that could be stopped (and PN progression halted) if our ignorance was not so deep. Or maybe some wonderful single discovery will stop all PN. (2) PN effects on muscles (An updated version was presented at the 3/3/18 mtg). 2016-Jun-4 Joe Trepenning, of Infinite Technologies (local provider, <Website>), discussed flexibility exercises to AVOID (or minimize) use of ankle braces to treat "drop foot". Drop foot (<Described in this PDF>) is a common symptom of PN since the nerves/muscles in the feet and lower leg tend to die/degrade first. Drop foot is one of the most dangerous aspects of PN, because it risks tripping and falling. Braces to help with it are called "Ankle Foot Orthotics" (AFOs). Insurance, like Medicare, will often pay for an AFO; they're the standard "quick fix." Expensive to Medicare because they are custom and need fitting. Cheap to the doctors because paperwork is minimal. The Medicare standard AFO is a completely inflexible piece of hard plastic that fits in your shoe and straps to your thigh. 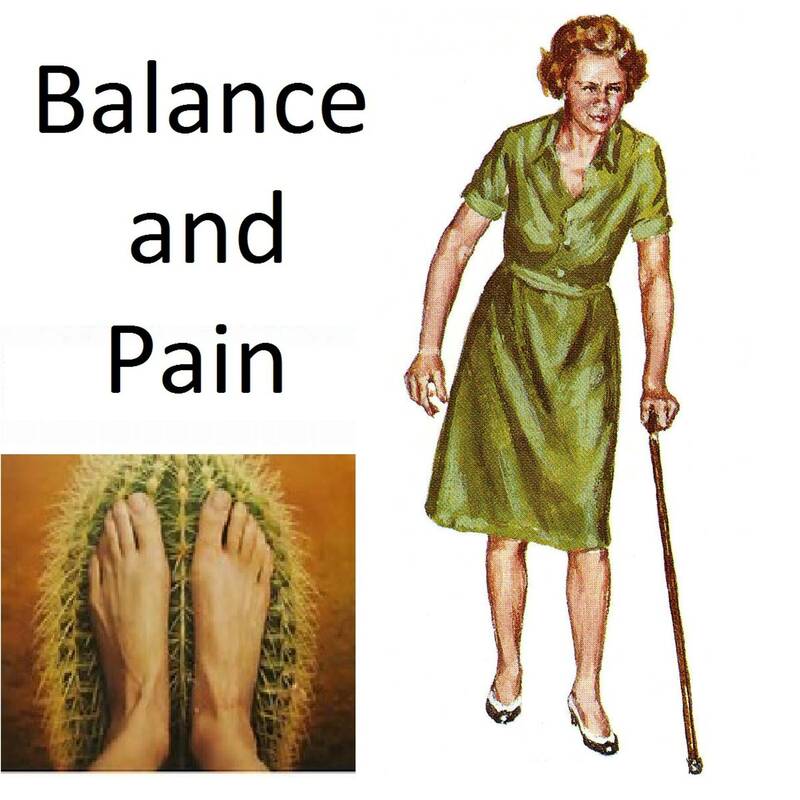 Joe said use of standard AFOs should be minimized or avoided, if possible, because of their downstream health consequences to your mobility, balance, gait and knees. <the Helios> is an example of custom devices designed to help preserve the body's natural "springiness". Normal walking minimizes fatigue by taking advantage of the body's ability to preserve energy from one step to the next. These types of devices are designed to make safe walking less fatiguing by preserving some flexibility. <FootUp by Ossur> For moderate cases, where there is still some ankle strength, over the counter, less expensive (<$100) solutions are available using strong elastic straps that pulls your foot up but still allows the flexibility to walk nearly normally. An example is FootUp by Ossur, available online in forms for use with or without shoes. Personal Note: In 2013, when I got really serious about Physical Therapy for my PN, I started working very hard on almost all the exercises. BUT: I failed to grasp the significance of the drop foot exercises. I did not give them the time and diligence they deserve. Started tripping. Got a standard AFO. Hated it. Painful, limiting, hard to use. Made walking a dangerous nightmare. But I still didn't do my drop foot exercises. Time passed and the drop foot got worse. NOW, I do my drop foot exercises every day and try variations frequently. I'm mostly keeping drop foot at bay. I don't use my AFO. I hope I never have to. I sometimes wish life didn't keep throwing me these intelligence tests. In June of 2018 I got an Ossur FootUp and my walking is much improved (or, at least, safer). I also found a YouTube video that showed a new exercise, where I use a cane handle to pull up the foot front and, isometric-like, try to keep it from falling back down. I also try to push down hard on my knees while raising my heels. Not sure why (no scientific claims here), but my foot strength (toe and heel raises) seems to be improving (from bad to less bad). My water aerobics partners look on in amazement as I am almost able to lift half-way up on my toes while half my body is supported by the water and I wildly wave my arms in my struggle not to fall backwards. I take little victories where I find them. Nov 3 - Reg mtg w/"horror story"
Oct 6 - Reg mtg. Awareness issues. Jul 28 - Pot Luck at Peter's house. We're special - only day without rain for 3 weeks! Jul 21 - Pot Luck Party at Peter's house.